Marketing promotions are crucial if brands want to remain relevant in the minds of consumers. However, gauging their effectiveness and calculating the marketing ROI is often a difficult task. 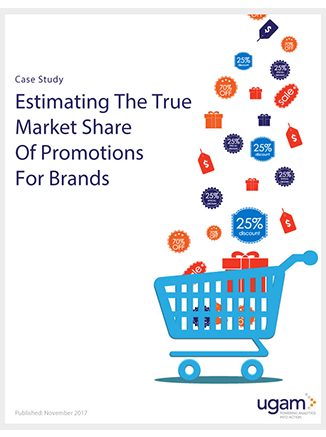 Ugam recently worked with a major cosmetics brand to help determine the value of their promotions, and realize the true market value they were bringing to the table for their brands. It was significant. Yes, send me emails on data-driven case studies, eBooks, blogs, analytics reports, newsletters, webinars and press releases. Thank you for downloading this Case Study! An e-mail will be sent to your inbox shortly. Sorry! Your exclusive link has expired. Please fill in the details to receive the free copy again. Ugam is a leading next generation data and analytics company. We work with retailers, distributors, manufacturers and research & consulting firms to enable superior data-driven decision-making. Ugam’s customer-centric approach, that blends data, technology and experts, has resulted in impactful and long-tenured relationships with over 75 Fortune 500 companies.